Have you ever tried to get the anabolic edge, but have come up short time and again? 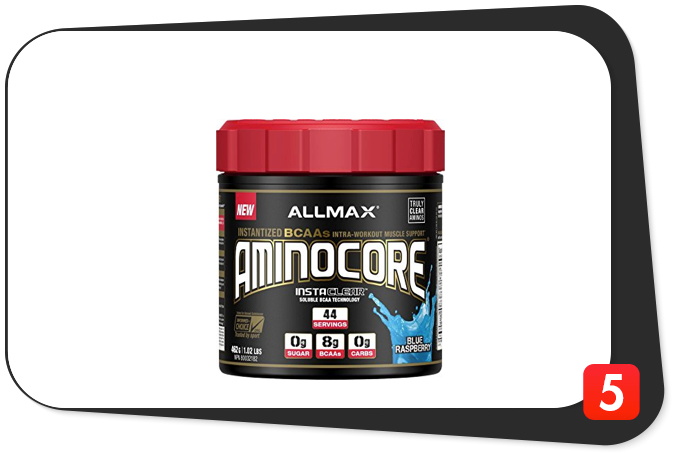 Don’t fret – ALLMAX AMINOCORE is here. This unique supplement’s 8.18 grams of BCAAs per serving and 45:30:25 BCAA ratio should help pique your interest. 8.18 grams of BCAAs per serving. High BCAA content. 45:30:25 BCAA ratio. Unique in every sense of the word. Awesome taste. Customers swear by it. OTHER INGREDIENTS: Citric Acid, Malic Acid, Natural and Artificial Flavors, Sucralose, Acesulfame Potassium, FD&C Blue No. 1, Lecithin (Sunflower). Directions: To activate protein synthesis and increase muscle recovery, take 1 serving of AMINOCORE during weight training or any athletic event. On non-training days, AMINOCORE can be taken anytime on an empty stomach. Due to the potent nature of this product, it is not recommended to exceed 2 servings daily. Pour 1 scoop of AMINOCORE into water and shake or stir well. Take during workouts, or anytime you want to decrease muscle breakdown and increase protein synthesis. Carefully read the instructions on the label and follow the directions before use. Many of the BCAA supplements we have reviewed claim science backs up their claims. As a customer, you can tell you if a particular product is legit or not. You have to trust your gut. One BCAA supplement which exceeded our expectations is Kris Gethin’s KAGED MUSCLE BCAA 2:1:1 – its fermented BCAA content and 2:1:1 ratio should get you going in and out of the gym. On that note, let’s see if ALLMAX AMINOCORE can kick it up a notch. This intra-workout and BCAA product seems like the real deal, folks. In fact, it’s one of the most unique BCAA supplements we’ve seen. The manufacturer says ALLMAX AMINOCORE’s instantized BCAA content has paved the way for a “Dominant Muscle Builder,” per its official website. Long story short, this product should help you remain in an anabolic state during your workouts and your non-training days. Sure sounds good to us. Get the anabolic edge with ALLMAX AMINOCORE. Wait, it gets better. Much better. Listen, a typical BCAA supplement has around five grams of branch-chained amino acids per serving. KAGED MUSCLE BCAA 2:1:1 is the perfect example. Well, ALLMAX AMINOCORE’s insane 8,180 mg (8.18 grams) of BCAAs per serving blows the competition out of the water. If that much doesn’t make your muscles grow, nothing will. That amount “is perfect for consumption during your workout to drive up anabolic impact, or away from the gym when you can’t get your protein in and you need to prevent the catabolic breakdown of muscle tissue and increase protein synthesis,” per ALLMAX Nutrition’s official website. Not only that, but ALLMAX AMINOCORE has the most unique BCAA ratio we’ve ever seen. How does a 45:30:25 ratio grab you? The manufacturer based this on research from the Nobel-prize winning Karolinska Institute in Stockholm, Sweden. The institute says high amounts of BCAAs on a 45:30:25 ratio “signals your muscles to grow,” per ALLMAX Nutrition’s official website. It also creates “pure protein synthesis (anabolism) on a scale that must be experienced to be believed,” per the same source. For comparison’s sake, most BCAA supplements feature a 2:1:1 BCAA ratio. Just so you know, that’s two servings of leucine (the most anabolic amino acid) for every serving of isoleucine and valine. Upping the amounts of isoleucine and leucine should help repair muscle tissue and increase endurance, among other things. Will slightly lowering the amount of leucine compromise your muscle-building efforts? If you keep track of your nutrition, exercise regularly, and get enough sleep, you should be fine. ALLMAX AMINOCORE has another awesome feature: instantized BCAAs. More specifically, this product “has INSTACLEAR, a cutting-edge solubility technology to BCAA dosage administration,” per its official website. “Our INSTACLEAR process flash-freeze-dries our BCAA powder to create a truly soluble and easily-mixed BCAA drink that absorbs in a truly liquid form,” per the same source. Take our word for it, folks: ALLMAX AMINOCLEAR is one of the few BCAA supplements which utilizes INSTACLEAR technology for improved bioavailability. Of course, better solubility yields better overall results. Many customers have been raving about ALLMAX AMINOCLEAR’s solubility – they say it is the real deal. The BCAA content is just the proverbial tip of the iceberg – this supplement also has alpha-ketoisocaproic acid (α-KIC) and an impressive B vitamin profile. Remember the burning sensation you felt after a hard workout? That could very well have been lactic acid buildup – the end result of your body craving for more oxygen than it can supply. The good news: when your body can withstand lactic acid buildup, you can train harder and longer. The bad news: many experts say it doesn’t improve exercise performance. Perhaps the manufacturer could have used creatine – a time-tested performance enhancer and muscle builder – instead. On the bright side, α-KIC is a leucine metabolite. The manufacturer claims it can “increase the levels of l-leucine at the sight of the muscle,” per its official website. On this note, α-KIC helps increase anabolism and muscle growth by plugging the leaks in muscle cells. To sum things up, α-KIC has questionable exercise performance benefits. However, it seems to have a promising upside in terms of muscle growth. ALLMAX AMINOCORE is one of the few BCAA supplements which has α-KIC. Better grab the opportunity. We also say ALLMAX AMINOCORE’s impressive B vitamin profile (vitamin B3, vitamin B6, vitamin B9, and vitamin B12) should help ramp up your energy levels and improve your heart health. Listen, each of these B vitamins is equal to an awesome 100 percent of the daily value (at least 15 percent is a high value). That much is equal to the B vitamin content of some big-name energy boosters. With that in mind, get ready to conquer your workouts and shore up your long-term health, folks. Don’t get too hyped up, though: ALLMAX AMINOCORE is not a perfect product. Aside from the unnecessary α-KIC content, this BCAA supplement also has a few fillers (sucralose and FD&C Blue No. 1). Despite these, ALLMAX AMINOCORE’s unique features make it a respectable BCAA product. Calories, 5: With a measly five calories per serving, there’s no way ALLMAX AMINOCORE will compromise your nutrition goals. Total carbohydrate, 0 g: Furthermore, this supplement’s zero grams of carbs per serving will complement your low-carb nutrition plan quite nicely. Sugars, 0 g: While zero grams of sugar per scoop is nice, the manufacturer should have done away with sucralose. This artificial sweetener has several side effects. Boo. Vitamin B3 (as niacin), 20 mg: A B vitamin which helps boost heart health and joint mobility, regulate blood sugar and blood pressure levels, improve digestion, and promote proper nerve function. Vitamin B6 (as pyridoxine HCl and pyridoxal-5′-phosphate [P5P]), 2 mg: This ingredient helps keep homocysteine levels (a non-protein amino acid detrimental to heart health) in check and regulate the nervous, cardiovascular, and immune systems. Vitamin B9 BioB9 (as folic acid and 5-methyltetrahydrofolate), 400 mcg: This B vitamin helps increase muscle growth, ward off nasty free radicals, and improve heart and brain health. Vitamin B12 (as methylcobalamin), 6 mcg: A component which helps ward off fatigue, keep free radicals at bay, boost cardiovascular function, and regulate the immune system. L-leucine (45 percent), 3,681 mg: Leucine is the most anabolic amino acid which helps kickstart the muscle protein synthesis process. It also helps preserve muscle mass and boost fat loss. L-valine (30 percent), 2,454 mg: A BCAA which helps increase endurance, repair muscle tissue, improve sleep quality, lower anxiety levels, shore up the immune system, and ramp up muscle growth. L-isoleucine (25 percent), 2,045 mg: This BCAA helps increase endurance, repair muscle tissue, shorten recovery time, regulate blood sugar levels, and retain a positive nitrogen balance. α-KIC (alpha ketoisocaproic acid), 50 mg: The manufacturer claims this ingredient helps buffer lactic acid and increase l-leucine levels. However, experts say α-KIC has unproven exercise performance benefits. Nevertheless, this leucine metabolite may help increase muscle growth. Can ALLMAX AMINOCORE give you the anabolic edge? If its insane 8.18 grams of BCAAs per 10.5-gram serving are any indication, your muscles are in for a real treat, folks. It bears repeating: this amount easily annihilates BCAA products’ branch-chained amino acid content. Like we said, 8.18 grams of BCAAs per scoop should also help you reap the full spectrum of BCAA benefits. We’re talking about increased muscle protein synthesis, more fat loss, ramped-up endurance levels, and less muscle soreness, among other things. As for the 45:30:25 BCAA ratio, we say it should work – the company links this to research from Karolinska Institute. Our take: never mess around with a Nobel prize winner. Science clearly backs up ALLMAX AMINOCORE – its unique BCAA amounts and ratio sets it apart from the rest of the pack. We feel the α-KIC inclusion should help shore up muscle growth, and then some. Hey, it’s a leucine metabolite after all. The thing is, we’re still torn on α-KIC’s exercise performance benefits – many experts will back us up on this one. On the other hand, when you include a potent dose of four B vitamins (100 percent of the daily value each) in your BCAA supplement , good things happen. With these around, expect to increase endurance, improve heart health, shore up antioxidant protection, and boost immune system function. ALLMAX AMINOCORE has other great benefits – it’s low in calories (a measly five per scoop) and has zero carbs and sugar. Did we also mention it tastes great? Many customers agree with our assessment. We’re confident you will, too. Plus, the company also displays excellent transparency – it reveals all of the ingredient amounts. No shady proprietary blends, either. Awesome. As great as ALLMAX AMINOCORE is, it has one glaring flaw: fillers. You see, this BCAA supplement has sucralose and FD&C Blue No. 1 – two dirty ingredients with certain side effects. Nonetheless, ALLMAX AMINOCORE’s pluses far outweigh its minuses. Go ahead and buy it, folks – it’s worth it. We agree with most of these claims (except for the part claiming it has no fillers). ALLMAX AMINOCORE is a top-notch BCAA supplement which should give you a fast return on your investment. The manufacturer intended ALLMAX AMINOCORE for healthy and active individuals who are at least 18 years old who want to increase muscle mass and endurance, boost fat loss, shorten recovery time, and achieve their long-term fitness goals. ALLMAX AMINOCORE contains 100 percent of the daily value for vitamin B3 (niacin), an ingredient which may cause “niacin flush” (a tingling or burning sensation in the face and chest areas). This supplement also has sucralose, an artificial sweetener which has certain side effects. Finally, this product has FD&C Blue No. 1, an artificial food coloring which also has several side effects. If these, or any other ingredient, make you feel doubtful, please consult your physician before buying ALLMAX AMINOCORE. Unique BCAA supplement. Adjective which best describes this product. High BCAA content. Whopping 8.18 grams per 10.5-gram scoop. Science-based. 45:30:25 BCAA ratio serves as hard evidence. α-KIC inclusion. Leucine metabolite which may ramp up muscle mass. Four B vitamins. One hundred percent of the daily value for each. Great transparency. Manufacturer reveals all of the ingredient amounts. Thumbs up. Awesome taste. Many customers swear by it. Fillers. Has sucralose and FD&C Blue No. 1. Boo. Let’s put the issue to rest once and for all – ALLMAX AMINOCORE will give you the anabolic edge. There’s no doubting its 8.18 grams of BCAAs per serving and its unique 45:30:25 BCAA ratio. It’s by no means a perfect product, but it’s a worthy addition to your supplement stack. We recommend you buy ALLMAX AMINOCORE and get the anabolic edge today.